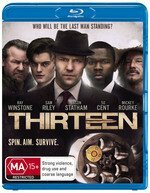 13 is a Hollywood remake of a gritty 2005 French film by the name of 13 Tzameti. Somewhat unusually it’s both written and directed by the director of the original, Gela Babluani, but whereas 13 Tzameti provided a singularly intense and visceral experience, particularly for a feature debut, its reboot is found rather lacking. Despite the fact it was filmed in colour, 13 comes across as a pale imitation of its black and white predecessor. Like Tzameti the film revolves around the underground world of Russian roulette, where those desperate for dollars gather in various shady locales to indulge in the potentially lethal ‘game.’ This time around Sam Riley stars as the cash-strapped youngster who assumes the identity of a dead man in order to take his place in the shady tournament. Mickey Rourke and Ray Winstone co-star as two of nutjob contestants, each trying to out-nutter the other in a loony display of one-upsmanship, action stalwart Jason Statham appears as ‘Jasper Bigges’, a wealthy Brit with a few quid riding on the outcome and a characteristically wooden Fiddy Cent also puts in a turn as a badass bouncer of sorts. It’s all entertaining enough and the majority of the performances are strong, particularly that of Riley, best known for his stellar turn as Ian Curtis in the Joy Division biopic Control, but the problem is it never really feels essential, particularly when there’s a far superior low-budget original gathering dust on the shelves of Siren HQ. None, the local BD release is bare bones.